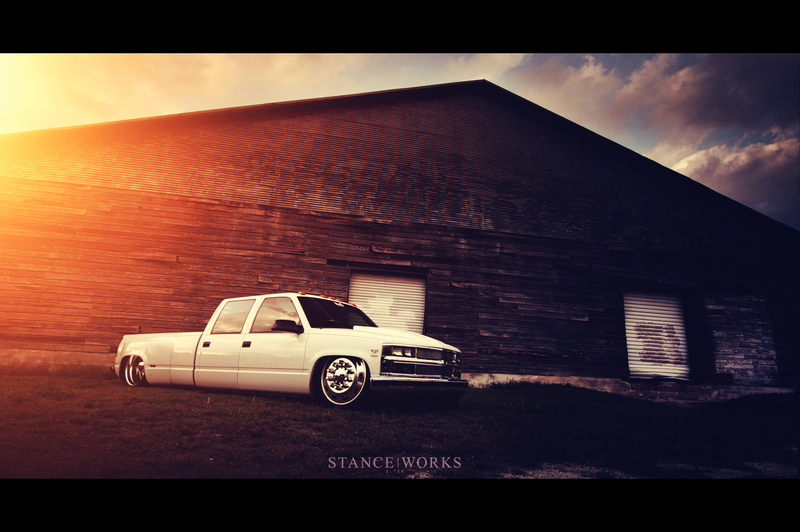 When most think of modifying a truck, they normally think of a few different directions to go. 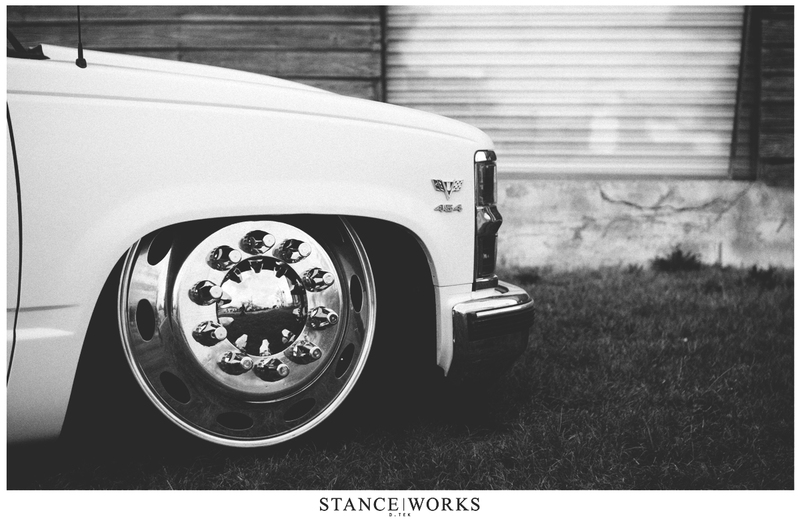 One obviously being mini-trucks, followed by the old school domestic trucks which make their way onto STANCE|WORKS from time to time. The last option involves diesels, stacks, chrome, and this weird thing where people raise them… but I’d rather not even think about that. 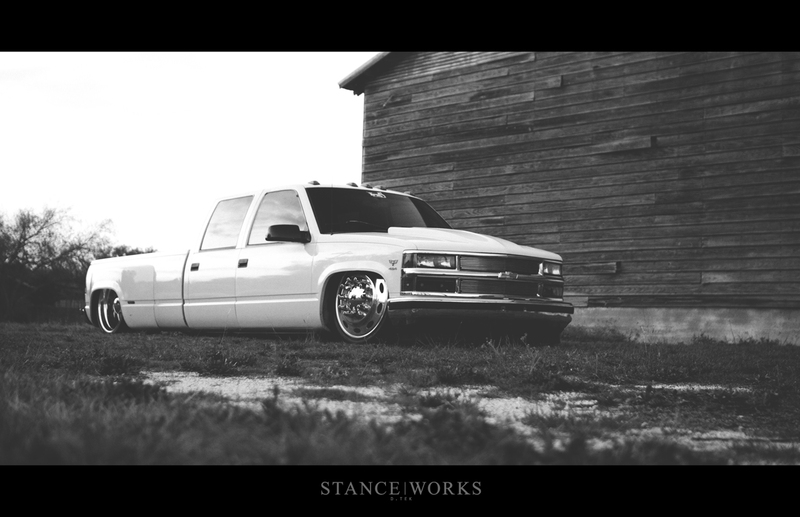 Every once in a while, however, someone builds a truck that makes you do a double take; it catches you off-guard. 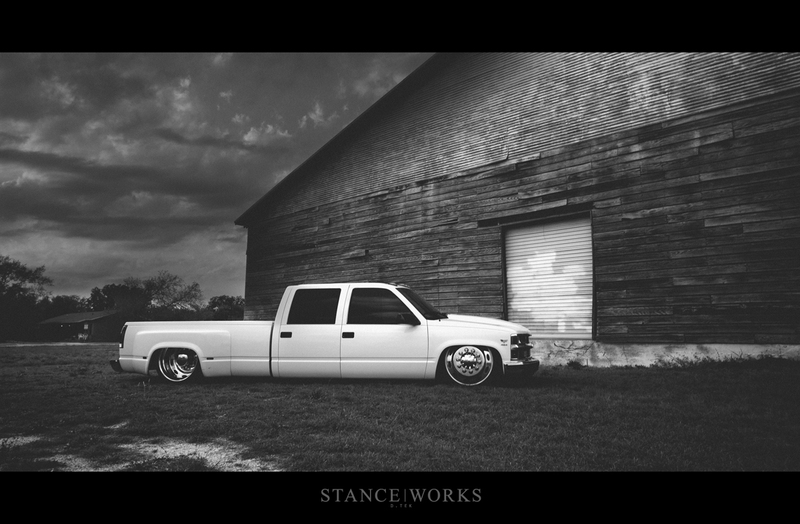 Mike Baldwin’s monolithic truck does just that. First off: this crew cab dually makes a Volkswagen GTI look like a Little Tikes Cozy Coupe that my 3-year-old son would drive. 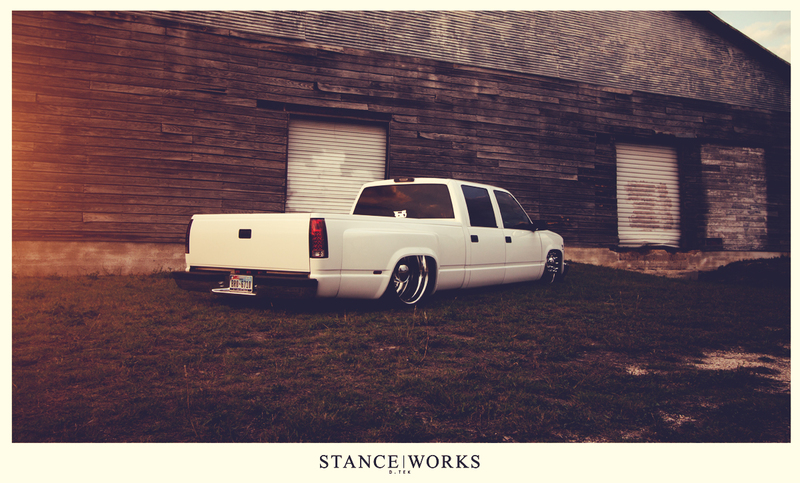 Its massive size also means that the excellent execution of Mike's laid-out truck is impossible to ignore. Mike’s objective wasn’t just to leave people wondering what they had just seen; he set out to build a truck that he could actually use and have fun while doing it. Mike needed a truck that was big enough to haul his magazine-featured 1990 Mitsubishi Mighty Max with ease, yet something casual enough to tackle long journeys in comfort. 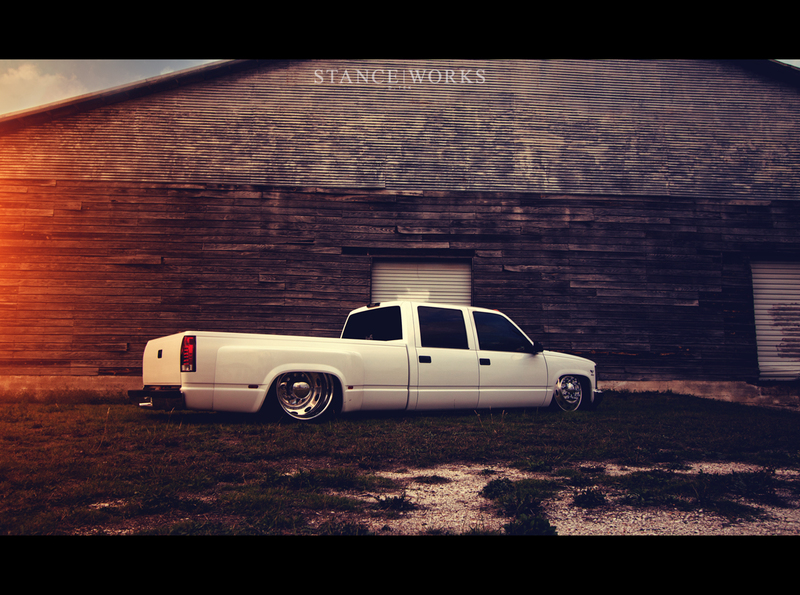 He felt that this 96 Chevy Dually would do the trick, but it would need some serious modification to meet his needs. 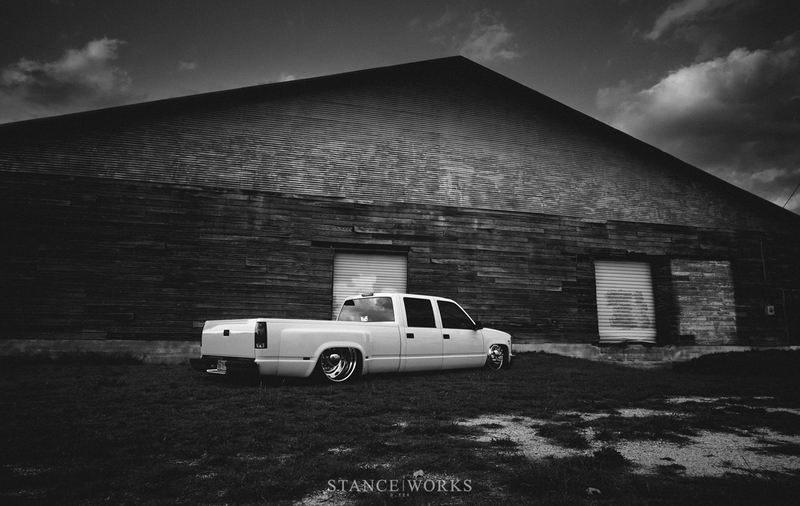 After all, a Chevy dually has never been the epitome of comfort. If you have ever driven one of these, you would understand that “big” just doesn’t really cover it. 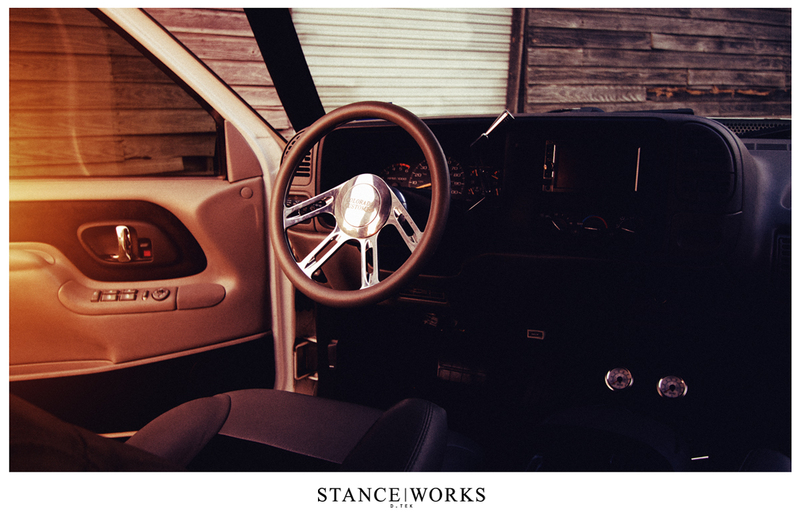 Inside is space for you and a few buddies with plenty of room to spread out comfortably. It’s also got a bed large enough for your GTI or Civic, and it can still pull whatever you need it to. It’s essentially one of the best “do it all” machines out there unless, of course, you are aiming for good gas mileage… then you're going to need the Cozy Coupe mentioned earlier. The most obvious modification to Mike’s behemoth are the massive 24.5” Semi wheels paired with how the truck hugs the ground like a teenager holding tight on his prom date. Such PDA is possible due to a complete overhaul of the suspension by Jeremy Rice at TRE5 Customs. Up front, Michigan Metal Works control arms and ¾ ton drop spindles were used to achieve the necessary camber. 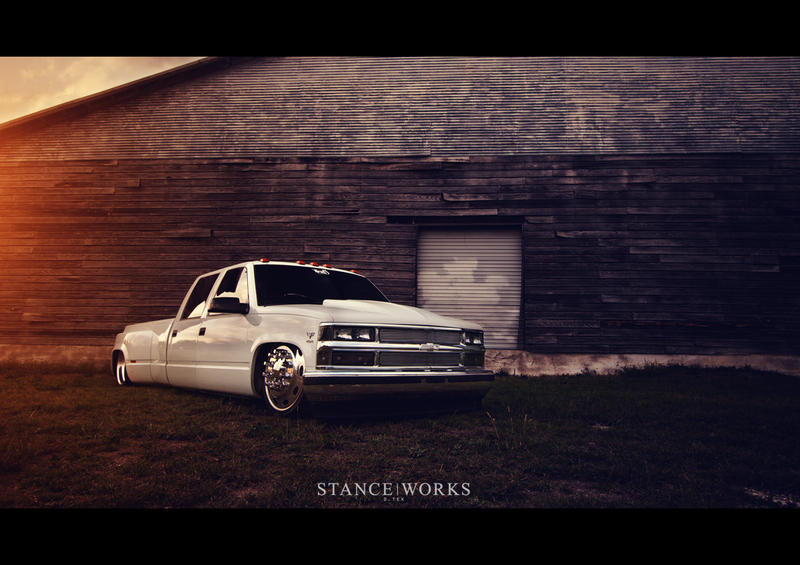 To put that camber to use, the front was dropped with Slam Specialties SS7 bags. The big task with the suspension, however, was the rear. Not because of how low Mike was wanting to go, but rather the wheel selection Mike had gone with. They had to custom-build a triangulated 4-link system and the axle had to be narrowed 10 inches in order to fit the semi-truck wheels. 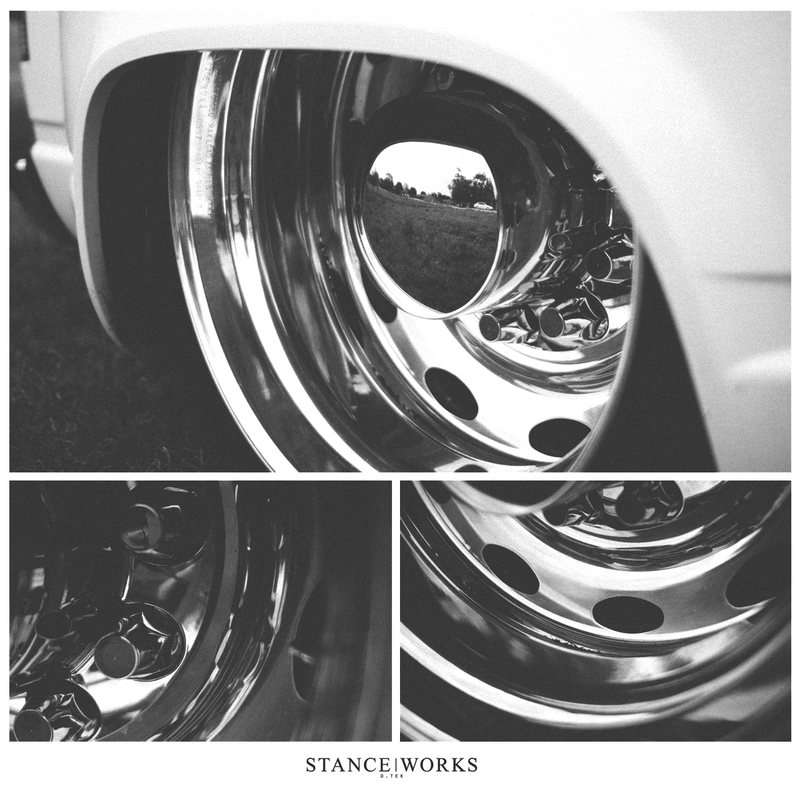 The wheels requiring all this work were 24.5” wheels off of a Peterbilt Semi that were milled down from 24.5 inches to 24 inches just so Mike could mount low-profile road tires. Setting the wide dually fenders down over the semi wheels in the rear are a pair of Firestone 2107’s, typically on motor-homes. To make sure this Chevy laid out without a hitch, Mike went with the Accuair VU4 manifold and a switch speed controller with 2 Viair 480s and two 7-gallon tanks to help lift all that iron up and down. With the outside taken care of, Mike turned his attention to the interior where long road trips would be spent. 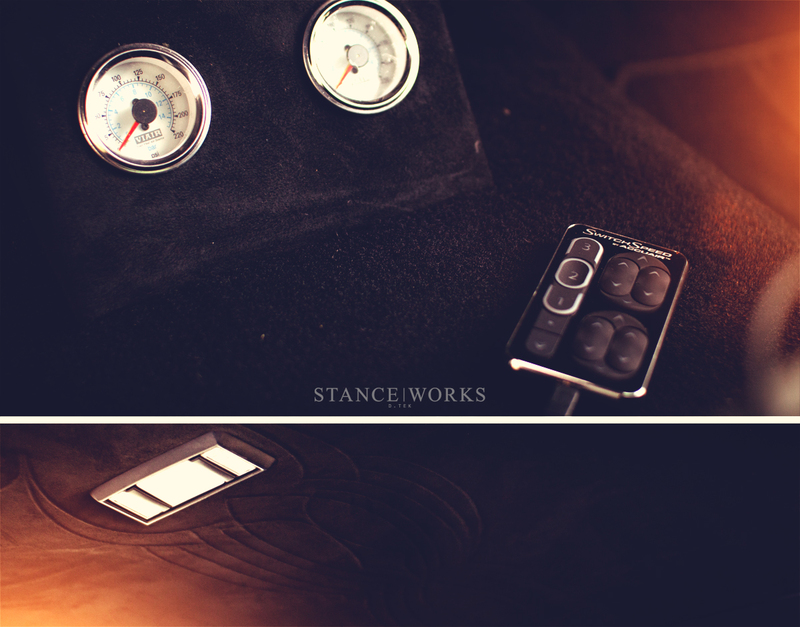 Change went throughout the interior by way of black suede and grey leather with the help of Todd at The Interior Shop. With all the comfort taken care of, Mike need to make sure his audio also met the standards of a road trip machine. Let’s face it: some good tunes make any trip more enjoyable. Mike turned the truck over to John and Robert at Total Auto Pros. The team installed a Kenwood 7inch touch-screen which was then connected with a full JL Audio set up. Mike’s monstrosity is a great example of someone who has managed to build a truck to be used just as it was meant to be – a truck. Sure you won’t be going rock-climbing anytime soon. but need to haul a new project home? Check. Need to help move a friend? Check. Need room to stretch your legs on a long trip? Check. Need to still be able to break necks no matter where you park? Hell yes. Looks like Mike nailed function and form. 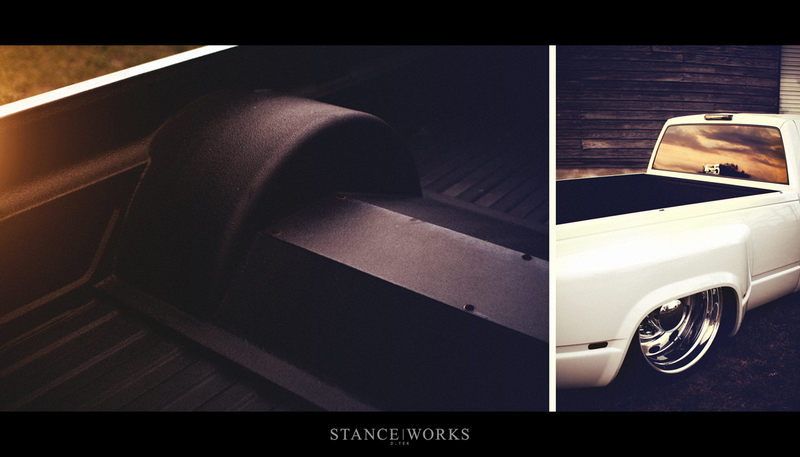 Fenders are stock. The rear end has been narrowed to allow the wheels to fit inside the factory width.